As the largest group of natural resource managers on the planet, farmers are at the interface of the changing relationship between humans and the environment. Typically organised around what might be considered the most basic of social units, for generations the family farm has survived wide-ranging exogenous challenges, frequently preserving the line of succession to the next of kin. Now as we face major questions about how we use land and the impact of our land use on the global environment, farming once again faces a challenging and uncertain future. 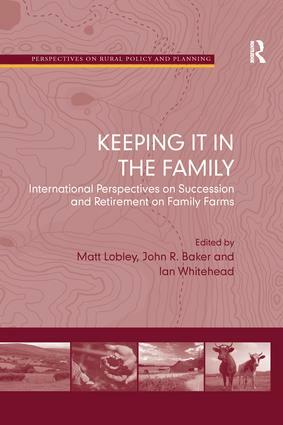 This book draws on the experiences of farmers in Australia, New Zealand, North America, Japan and the EU to examine the special features of family farms and, in particular, the tradition of succession which has enabled them to continue to have such a strong presence in the world today.